No this post is not about the 2012 VW Beetle that was launched earlier this week in three cities around the world. This post is about a profound idea that is changing our world – “Small is the new Big.” The magnitude of this concept is not so apparent at first look but when you think about it our world is becoming smaller in every way imaginable. 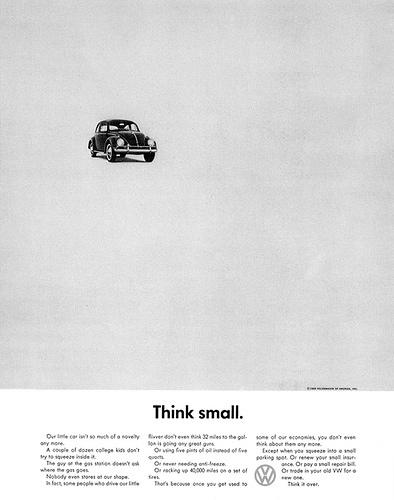 Being an ad man the earliest example of this phenomena was seen in the 1950s when Bill Bernbach engineered the idea of “Think Small” to introduce the Beetle which was relatively a smaller and a simpler car than it’s competitors. At the time this was a radical idea where big was always better than small. Soon however small became the norm. The concept was here to stay as it evolved from something that was undesirable to something that signified technological innovation. Today for everything from the iPod Nano with multi-touch to the latest Intel microprocessor small is the new big. Then something else happened. Small took popular culture by a storm. A concept that was largely limited to technology and the manufacturing industry started to impact everything from entertainment to communication and even business. The longer way of communicating through letters changed to shorter instant mail. With the advent of YouTube the way we consume video evolved to include everything from the 60 minutes plus content to short clips sometimes as small as 30 seconds. SMS has become a part of global communication culture both at a business and a personal level. Teens have even created their own short hand language which they use while they instant message over the internet. Blogs have redefined the publishing industry. While people still read a lot of books (and e-books), a lot of them read content online on blogs and they are far smaller than other types of published material. Twitter has taken this one step further by introducing us to micro-blogging and limiting what we share at a time to 140 characters. The world has becoming a really small place. Science is proving that we are separated to each other by only six degrees. That means all six billion of us are connected to each other in as many as six steps. Those who are on social networks like Facebook, Twitter or LinkedIn for example. a connection can be made in only one small step. And now Rory Sutherland on TED. talks about the power of small to have a really big impact. He introduces an interesting grid about how certain big things like ‘Consulting’ cost a lot of money but have little real life impact (he does not think highly of consultants…sorry folks!) Similarly ‘Strategy’ is about big actions that create a big impact (Yess!) But what was really interesting was this unnamed quadrant – how some really small actions can have a really big impact. These are usually tactics that seem trivial and counterintuitive as a solution to certain big problems but they work. At this point he is not sure about what to name this concept but he makes a strong case for these certain type of small actions. They could be the key to solving a whole bunch of social, economic and even political problems. Profound. Check out the talk below. I am not sure if he has managed to coin a name for this yet. Sure would like to give it a crack! Ideas anyone? Fascinating blog regarding the power of innovative ideas. Thanks for sharing.